The best angle grinders are the most versatile tools on the market today. These handheld devices are popular in construction sites, garages, and metalworking workshops. The reason for their popularity is mainly because they can perform a bevy of functions super fast. You could also have an angle grinder around your home if you are a DIY weekend warrior. This is their most common use, hence their name. After welding, you’ll certainly need to grind metal weld seams to give them a seamless finish. These tools also make appearances when shaping stones and sanding away excess mortar. By attaching a sanding pad, you can use the best angle grinders as woodwork tools too. It makes stripping off old paint easy and fast. However, you’ll want to use the right grit abrasive depending on the amount of work at hand. The best angle grinders are also ideal for sharpening axes, lawn mower blades, and hatchets. You can also sharpen your ice scrapers, hoes, and shovels with it. Builders also find them useful when removing caked-on mortar on wheelbarrows, shovels and other construction tools. Dewalt DWE4012 is one of the best angle grinders for 2017, in our opinion. This tool features a 7.5amp motor that rotates the wheel at up to 12000 rpm. This feature alone makes the grinder a surefire for light to medium tasks. You might consider having it for some household projects or your workplace. The first impressive feature about the DWE4012 is its durability. As with most tools from this brand, the DWE4012 features a tough metal house. This feature makes it a tough tool that can easily slide into your toolbox for easy transportation. Its heavy-duty construction also allows it to handle several drops on your jobsite’s floors. On the same note about durability, this grinder features Dewalt’s high overload protection technology. This means that you can cut through hard metals at high speeds without any fear of overheating. The low profile with this tool also makes it one of the best angle grinders in 2017 reviews. The DWE4012 measures 15.4 x 4.6 x 6.1 inches and weighs around 5.6 pounds. These measurements mean that you can handle the tool for long without fatiguing easily. Speaking of holding the tool, this grinder has a slim ergonomic body. The handle fits in your hands easily so you can hold it comfortably for extended applications. By the same vein, Dewalt DWE4012 features a 2-position removable handle. As such, you can use it either on the left or right hand. This increases not only your comfort but its versatility too. You might also like DWE4012’s one-touch guard feature. This feature allows you to change the position of the guard simply by pushing it. There are no levers or buttons for that. Though a simple feature, this significantly makes it easy to work with this tool. It also means that you spend more time working other than tweaking the tool. One thing that our reviewers appreciated about the DWE4012 is its degree of versatility. This tool features a 5/8″-11 spindle thread. What’s interesting about it is that it accommodates a wide range of 4-1/2 accessories. For instance, you can add a wire brush for cleaning metal and removing rust and paint. You can also attach a 4-1/2-inch flapper wheel for sharpening your farm tools. What’s more interesting is that this grinder has Quick-Change Wheel Release mechanism. Simply put, this design allows you to replace your wheels tool-free. Metabo WEV15-125 is one of the best angle grinders for heavy-duty use. This is according to our evaluations and comparisons. If your work comprises cutting through stones and preparing marbles, you probably require a grinder with a strong motor. In that case, Metabo WEV15-125 HT might be a good tool for you. This grinder boasts a 13.5-amp motor. This is among the most powerful motors that you’ll find on the market today. It makes working through hard materials fast. This 1500-watt motor makes 2800-9600 RPMs. What’s so interesting here is that you can choose your ideal speed depending on your projects. This feature also makes the WEV15-125 HT one of the best angle grinders for beginners. Speaking of beginner handymen, this grinder also features S-Automatic Safety Clip Clutch. This an essential feature that boosts the users’ safety by preventing kickback. It also has a soft start that eliminates dangerous vibrations when starting. Another impressive detail with this tool is its Electronic Speed Stabilization. Basically, this technology detects and minimizes the loss of traction. It also has overload protection which prevents it from burning. For durability, Metabo WEV15-125 HT easily accepts several optional dust collection accessories. This grinder also has a great design that optimizes air flow into the motor chamber. This feature allows cooler operations and also boosts the motor’s lifespan. It also has power interruption protection detailing to protect it from power surges. We cannot talk of the best angle grinders in 2017 without having a grinder or 2 from Makita. This brand stands out from the crowd due to its models’ durability and versatility. 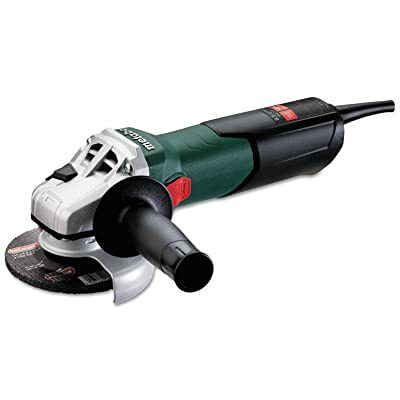 Take the GA70217 angle grinder, for instance. This unit is simply a beast. Its 15-amp motor is among the strongest we have on this list. It requires 120 volts of power and can cut or grind anything that you throw its way. Interestingly, you can fit other wheels of lower sizes for different tasks. An impressive feature on this motor is its labyrinth anti-dust protection. This case seals the motor and protects it from metal chips and dust. As such, you are assured that the motor will serve you for long. Makita GA7021 is quite heavy at 10.4 pounds. For comparison, Dewalt DWE4012 and Metabo WEV15-125 weigh 5.6lbs and 6.5 pounds respectively. Fortunately, Makita GA7021 has several features to make up for this. First, check out its rear handle. This is a slim handle that you can easily grasp in your hands than the big handles on other models. Again, this handle is rubberized and offers a comfortable grip for quicker material removal. You might also like its 3-position side handle. You can conveniently mount it on the right or left-hand side or even at the top. 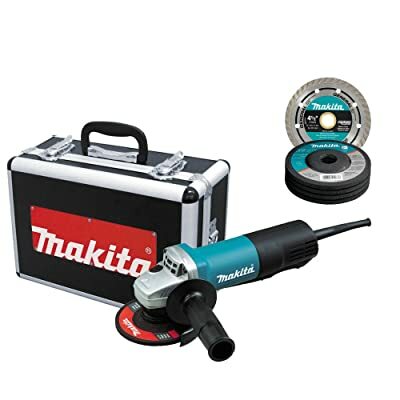 In addition to this, Makita GA7021 boasts a 90-degree rotating gear house. These 2 features make this tool ideal for heavy-duty cutting applications. Even better, this grinder also accepts other 7-inch wheels and discs for different purposes. Interestingly, it also boasts a spindle lock. So you can change the wheels tool-free. Most of its users also seem impressed by its protection guard. This shield is light but powerful. It adjusts easily and tool-freely to direct the sparks and dust away from you. Another feature that you might also like is its spring-loaded on/off switch. A push on/Push off switch is at times a safety hazard especially for new users. The spring-loaded switch with this GA7021 allows ease of use and turns the motor instantly upon release. Again, this switch also has a lock on. As such, you are not restricted to have your fingers in one location throughout. 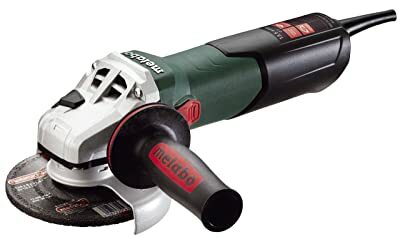 Metabo W9-115 might be a good tool if you’re in need of the best angle grinders for welding classes. This model strikes a balance between versatility, affordability, and functionality. Metabo W9-115 uses a 4.5-inch wheel. One thing that we find quite arresting about this tool is its good size. This grinder measures 11.9 x 2.9 x 12 inches and weighs around 5.8 pounds only. This makes it a good tool that you can take to and from school or jobsite with much ease. It’s also powerful. Metabo W9-115 uses a power 8.5-amp motor. Worth pointing out, this motor can use AC or DC power. This means that you can use it with a battery where AC isn’t available. This, again, adds to its ease of portability. The motor makes 10,500 rotations per minute. As such, you are able to grind or cut super fast. Its locking switch is another nice feature that might please you. This is quite different from grinders that have spring-loaded switches. Here, you can turn the switch on and move your hands freely without being restricted to a single position. This makes it easy to tackle your projects with precision and comfortably. Another feature that makes the W9-115 one of the best angle grinders for 2017 is its ease of assembly. It has a button on top that locks or unlocks the spindle when changing the wheels or discs. On this note still, this tool features Metabo’s S-automatic safety clutch. This clutch gives you control over the grinder even after sudden jamming. This reduces kickbacks. As a welder, you might want to maintain more than one grinder around your workshop. For instance, you might have one with a grinding wheel and another one with a wire cup brush. This way, you won’t have to stop regularly to change the wheels. So your projects move faster. However, purchasing 2 angle grinders at once can at times be quite impossible especially for the high-end models. Fortunately, there still exist some affordable models with high end features. Enter Skil 9296-01. 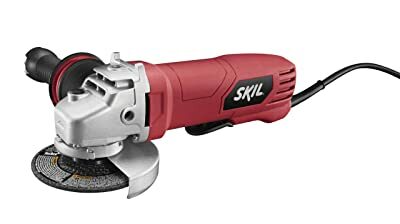 Skil 9296-01 is one of the best affordable angle grinders for 2017. At below 50 bucks, you can easily grab 2 of these at once and rock your grinding or polishing projects. There’s so much to love about this tool. First, this tool features a 7.5-amp motor. This is despite its low price. This is a 120-volt motor that draws enough heat for your sanding and cutting needs. Second, Skil 9296-01 uses a non-locking paddle switch. It is at the bottom where you’ll be holding the grinder on. Its non-locking design means that the wheel will only be running when you’re using the grinder. This is a superb safety feature for beginners and pros alike. Again, this grinder weighs less than 5 pounds. So holding it on your hands for long won’t be a problem. Also, it comes with an 8-foot chord that highly contributes to its maneuverability. Notably, Skil 9296-01 comes with a 3-position anti-vibration handle. This feature means that you can handle the grinder from the left, right or at the top. Worth mentioning, this increases the ease of grinding or sanding and also lessens fatigue. Dewalt has been manufacturing heavy-duty powered tools since 1924. 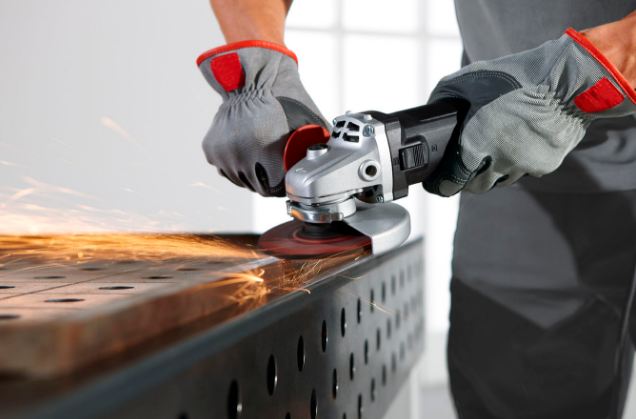 If you are a fan of their tools, the DW840K angle grinder might be good for you. In our opinion, this is a well-rounded too with incredible value for your money. 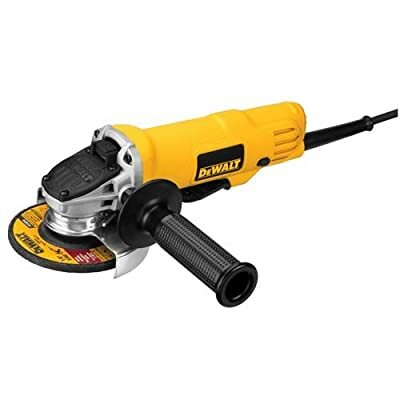 Dewalt DW840K is a 7-inch grinder. It uses a 13-amp motor that makes up to 8,000 rpm. 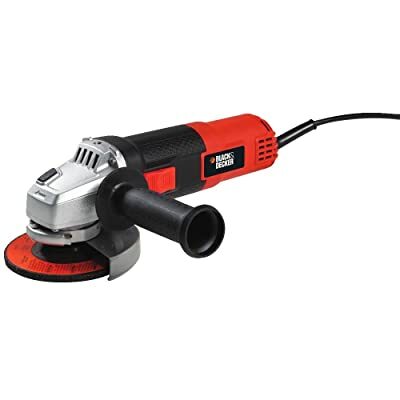 This grinder has enough torque to take you through most of your grinding or sanding needs. You can cut through metal and even grind concrete easily. Interestingly, it does this without being so huge. This grinder measures 5.8 x 21.4 x 12.4 inches. As such, you’ll be able to use it in compact areas such under sinks easily. Again, the DW840K has an incredible power-to-weight ratio. So you can work on your grinding applications without much fatigue. To add on to this, this tool has a nice rear handle for great maneuverability. Of most importance, the ON/OFF switch is right where you hold the tool. Again, the DW840K has a non-lock paddle switch under the handle for easy and safe operations. You might want to go for a tool with these 2 features if you’re starting out. Again, this Dewalt package comes with a set of 5 metal grinding wheels to start you off. These wheels are of great quality and lasts long. Interestingly, the grinder accepts both AC and DC power too. This feature lets you take the grinder from site to site. 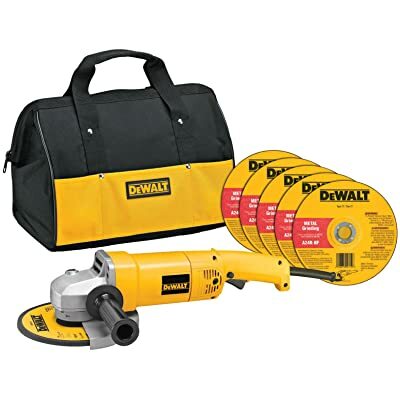 Speaking of portability, this Dewalt grinder comes with a heavy-duty bag. This is a thick nylon-reinforced bag. So it lets you carry everything you need compactly. Porter Cable PC18AG is one of the best portable angle grinders for 2017, in our opinion. The major problem that plagues most corded tools is limitation by the length of their cords. Again, it’s quite hard to use them in areas without power outlets. 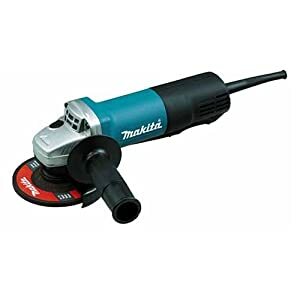 If you are sanding or welding on roofs or ceilings, you might want a grinder with a long cord. Unfortunately, long cords affect maneuverability. They are also expensive. That’s where grinders with rechargeable batteries come in. These are tools that you can take anywhere without cord or power socket limitations. The Porter Cable PC18AG reigns supreme here. 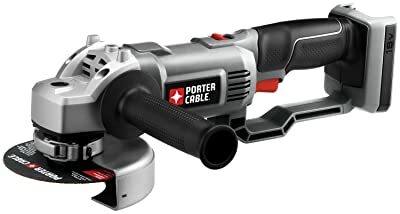 At a glance, anyone will tell that Porter Cable is a heavy-duty grinder meant for the serious handymen. It features heavy cast metal construction that increases its jobsite durability and longevity. This grinder uses an 18-volt motor. It makes up to 8,500 RPMs. 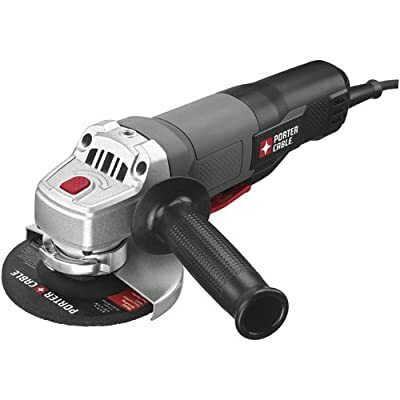 As such, it’s ideal for cutting metal pieces, bolts, and grinding concrete. You can also use it to remove rust and paint. What makes it one of the best angle grinders 2017 is its construction design. The PC18AG is of good size at 15.2’’ x 6.1’’ x 5.8’’. It’s also lightweight at around 6 pounds. Again, Porter Cable PC18AG features a nicely designed rear handle. The handle is rubberized and has a good grip. So you’ll be able to hold the tool comfortably in your applications. This is made even better by its 3-position side handle. This feature means that you can use the tool from multiple positions. Porter Cable PC18AG uses a rechargeable 18v battery (not included). It can run for 30-45 minutes on a single charge. As such, you might consider having 2 batteries for replacement for longer applications. Are you looking for the best angle grinder below 100 dollars by Porter Cable? The PC60TPAG might interest you. This is a favorably rated grinder on the market today. Unlike the PC18AG above, the PC60TPAG is corded. As such, you won’t have to purchase rechargeable batteries and a charger. Even better, you won’t have to stop at the middle of your projects to recharge any battery. Like other Porter-Cable grinders, the manufacturer seems to have pinned it in a bid to bring a functional tool here. We’d like to note its 7-amp motor. This motor draws 120 volts of power. It spins the spindle at 11,000 RPMs. At such speeds, you’ll be able to carry out different projects including cutting fine metal, polishing, and brickwork. Another feature that makes the PC60TPAG one of the best angle grinders is its lightweight design. At 4.1lbs, this is, in our opinion, the lightest grinder on the market today. This weight makes it a go-to grinder for long projects. On this note too, the PC60TPAG boasts a non-locking paddle switch under the handle. Like the PC18AG above, this grinder has a 3-position side handle. This feature also adds to its maneuverability and ease of use. This is a grinder that you’ll again use for some years or decades to come. It features a hard metal casing. This casing enables it to withstand harassment at your job sites and inside your toolbox. Makita 9557PBX1 tops our list of the best angle grinders reviews 2017. This is a handyman’s favorite given its indispensable price tag and versatility. If you need an affordable grinder that cuts through metal like butter, the 9557PBX1 might be it. This grinder stands out from the rest right from the word go. It features a sturdy exterior featuring hard plastics and cast metal. This gives you a hint about its reliability. Makita 9557PBX features a powerful 7-amp motor that motor makes 10,000 rotations per minute. This motor is ideal for light to heavy-duty cutting and grinding applications. As such, you might consider going for it for both home and industrial use. This motor features an impeccable labyrinth construction seal too. It protects the motor from intense cutting and grinding and also gives it a longer life. About operations, the 9557BX can use either AC or DC power. This feature makes it possible to use the tool with whichever type of power that is available. Again, this tool boasts a large paddle switch that offers easy operations. In addition, the 9557BX has a lock on/off feature. This allows continuous operations. The package comes with 4 4-1/2’’ grinding wheels. You also get an extra Makita diamond blade. Reviewers report that these wheels have pretty good performance. They cut through tough metals in minutes. Moreover, you also get a durable, well-built carrying case with this package. This is a compact aluminum box. It has zinc-coated latches that give it a nice deluxe look. Its inner side features rubberized foam that offers added protection to your tool and other accessories. Notably, this case has sections for the tools and the wheels and discs. This prevents the wheels from damage. Those who want the best angle grinders that won’t cost them the earth are better off with the BDEG400. This Black and Decker tool is currently the best-selling model in its category. Its main advantage is the versatility that it brings at such an unbelievable price. Black and Decker BDEG400 boasts a 4.5-inch wheel. Accompanying this wheel is a 6-amp motor. In our opinion, this is about the right size for this wheel. The motor rotates it at a speed of 10,000 rpm. This speed makes it a good tool for cutting into concrete and metal without bogging. Most of its users seem impressed by its ease of use too. For one, Black and Decker BDE400 is small. It measures 12.5’’ x 5.2’’ x 4.6’’ and weighs around 4.4 pounds only. Again, it features a slim barrel grip handle with a small circumference. So people with small hands might also be able to use it with much ease. The BDEG400 also features a lockable switch. The switch has a nice feel. It’s large enough to push even with your workshop gloves on. Again, it’s also hard to push it on accidentally. Its lockable design is a good feature for long cutting or grinding. Without forgetting, this grinder also has a 3-position side handle. It also has a spindle lock. So you can change the accessories in a minute. Purchasing the best angle grinders for home or construction site is a simple objective. However, several considerations need to be put in mind owing to the myriad of options available on the market today. The market flaunts angle grinders at all prices. You’ll find some grinders at prices as low as 30 bucks and others at over 300 dollars. If you need a grinder for some light tasks around your home, cheap electricity-powered units should suffice. Unfortunately, most of the lowly-priced units limit what you can do with them. They also tend to break down easily- you get what you pay for, remember? As such, it’s worth paying the extra cost for a unit that has good performance, durability, and safety. See more top grinders. Gas-powered angle grinders– like it’s always the case with gas-powered equipment, these are the best angle grinders regarding power. They are also big and can handle heavy tasks with much precision. These units are best suited for cutting, bricks, steel, and blocks. Given their complexity, these units require lots of experience to work with. The best gas-powered grinders are thus ideal for construction sites. Electric angle grinders– corded angle grinders are your best shot if you want a tool for light to medium tasks. These units are relatively affordable than gas-powered and the pneumatic models. They use electricity from wall sockets, generators, and even from batteries. In most instances, electric angle grinders are super compact, light and easily portable. These features make them ideal for moving to different work sites. Compressed air/ Pneumatic grinders– also known as air grinders, these tools use compressed air as their source of power. They are more powerful than electric grinders and a bit more expensive. Air grinders are most common in auto shops. They are ideal for general high-speed polishing, cleaning tire molding, and grinding in confined areas. Angle grinders vary in terms of the size of their discs. Grinder discs range from 4.5 inches through 9 inches. 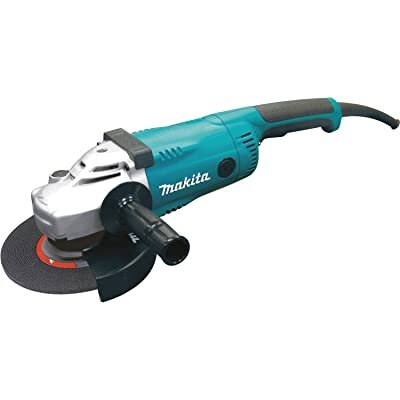 As a general rule, large discs are ideal for cutting larger surfaces and bigger depths. Large discs measure 7 to 9 inches. On the other hand, small discs 4.5-6 are good for smaller jobs. Usually indicated as RPM, this refers to the number of rotations that the motor turns the blade in a minute. Angle grinders vary in this too. The slowest grinders make around 2000 rpm. The fastest can go as high as 10,000 rpm. Usually, the higher the RPMs, the faster the blade will cut. Unfortunately, high-speed angle grinders also tend to overheat easily. This may affect the tool’s performance or even destroy it. Low-speed grinders aren’t as fast as high-speed units. However, they are easy to operate and don’t produce a lot of noise and heat. Fortunately, manufacturers are pushing grinders with adjustable speeds. This feature helps in working on different types of surfaces with just the required amount of heat. It’s also important to understand the motor’s strength. Worth noting, small grinders are, more often than not, faster than large grinders. Motors with a high amp rating will spin faster than those with a lower rating. People who are new to the use of these tools can easily get injured by them. The good idea is to start the machine at the lowest speed and adjust slowly. This feature makes the tool more maneuverable. This reduces the chances of accidents. Anti-vibration handles also contribute to your comforts. You might also want to go for a tool with brakes. A grinder making around 7000 RPMs can be so dangerous. Luckily, some have brakes that stop them in about 2 seconds. The best angle grinders produce a lot of dust and chips at high speeds. As such, you might want to go for a tool that has an adjustable guard. This guard reduces the number of chips coming your way. In addition to this, it’s important to put a dust mask and heavy workshop gloves on. Two things that affect the affect the ease of using an angle grinder are its size and weight. However, this greatly changes if the tool has a movable side handle. This feature means that you can use the grinder with either hand. A switchable side handle also makes the tool more versatile. So, what’s the best right-angled grinder for 2017? Find out in our reviews below. Angle grinders are among the most versatile tools in any handyman’s toolbox. As you have seen in our best angle grinders reviews, these tools vary in size and performance. They also have varying costs. If you are after an affordable grinder that won’t break the bank, Black and Decker BDEG400 got your back. If versatility concerns you, the 7’’ Dewalt DW840K might be your thing. This one allows you to use different size wheels. As such, you can handle different tasks with precision. Lastly, don’t forget to check out the Porter Cable PC18AG. It uses a rechargeable battery. As such, you can take it anywhere where the corded models can’t go. That’s it. What’s your take on our list of the best angle grinders 2017? Leave your comment in the comments section. This site really helped me a lot of things I want to know. You’re so awesome. Thank you.